High Performance Wireless Network – Throughwave (Thailand) Co.,Ltd. Wireless network has become one of the most important network infrastructure today with the trends of notebooks, netbooks, smart phones, tablets and voice over WLAN. From the user’s perspective, wireless network is a basic network infrastructure that every organization must have! But from the organization’s and IT administrator’s perspectives, wireless network performance and security are the problems. Almost all of the controller-based wireless vendors have the same problem, bottle neck at the controller, for both performance and security. If they want wireless N, 300Mbps throughput for each radio on each AP, they may want a chassis of 30Gbps throughput to avoid the bottleneck. On the other hand, they still need the controller to be able to inspect all packets switching through it – to encrypt/decrypt, to enforce firewall policy, to shape the bandwidth, to detect the attacks – and these activities on the controller make the network slow down. Throughwave Thailand comes with Trapeze Networks to provide you the best of the wireless n solution with extreme performance and 100% guarantee on security. 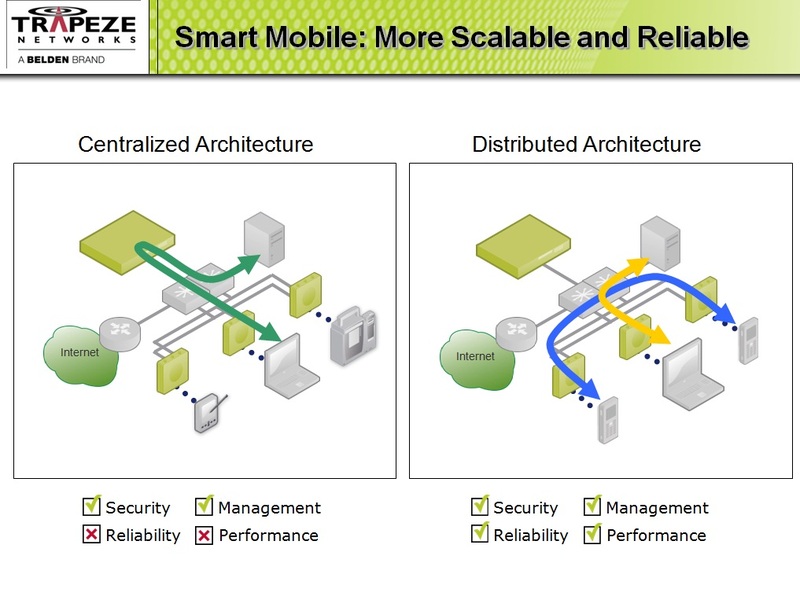 Trapeze Networks, a Juniper Networks Brand, uses distributed switching architecture by letting all wireless access points to act as a layer 2 switching, enables all access points to forward all traffic without any bottleneck on the controller. Not just being the switch, each access point still have the hardware encryption engine, web authentication, firewall policy, IDS/IPS, WIDS/WIPS and bandwidth shaping capabilities to ensure the security at the point each user connects to the network and make your network more resiliency. NO OTHER WIRELESS VENDOR CAN DO THIS FOR YOU!